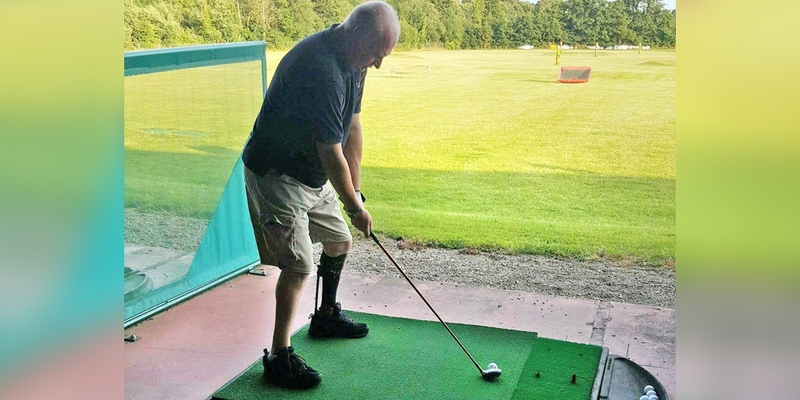 After being born with Club Foot, the Momentum brace is helping Gareth enjoy golfing pain-free for the first time in years. Gareth was born with Congenital Talipes Equino Varus (Club Foot), a condition where babies are born with one or both of their feet pointing downwards and turned inwards. In Gareth’s case, both of his feet were affected and he has undergone several operations throughout his life, leaving him with limited mobility and pain after physical activity. Gareth’s favourite hobby is golfing; he loves to play and has done regularly for decades. However, the repetitive twisting motion involved has caused further problems with his left foot, leaving him in severe pain after each round of golf and for several days afterwards. Gareth tried various orthotic devices and joined a flat golf course. He also underwent 3 more surgeries and even considered amputation. Unfortunately, nothing Gareth tried helped with his pain and, in 2014 Gareth gave up his golf membership. Shortly afterwards, Gareth heard about the Momentum brace. He saw videos of people with similar conditions to him able to run again pain-free after being fitted with Momentum. Momentum is an innovative custom carbon fibre AFO. Designed to partially offload the foot and ankle to stabilise and relieve pressure and pain following complex lower limb injury. With carbon fibre struts that work much like prosthetic running blades, it stores and returns energy to enable participation in high impact activities such as running.